PowerLight Free-Space Power Beaming technology supports unmanned aerial vehicles (UAVs) conducting surveillance or relaying communications. It tracks and charges the UAV while it is in the sky. 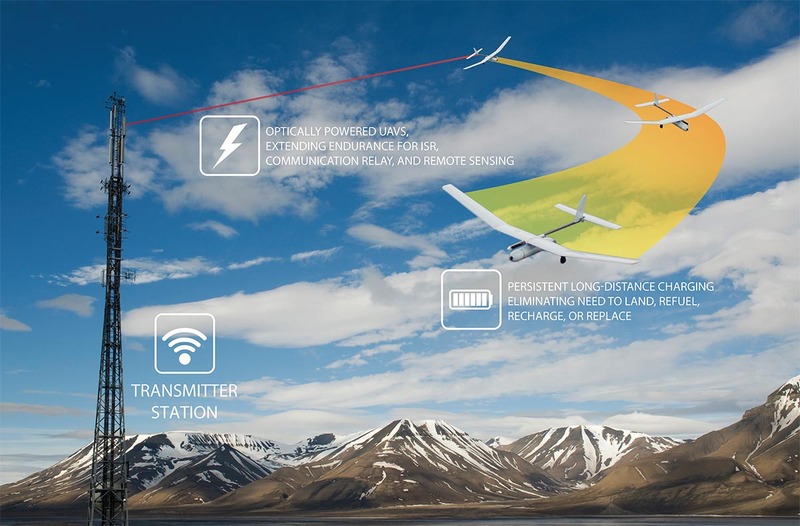 The technology recharges the UAV while it is airborne, enabling it to operate persistently—through greater distances. This persistence enables operational savings and safety, in part by reducing takeoffs and landings, which are the highest-risk situations of UAV operation. The technology does not use magnetic or electric fields, enabling the UAV to reach substantially greater distances than assets using electric/magnetic systems. This capability uniquely allows the UAV to stay in service without the need for repeated recharging. The technology saves time spent on landing, changing batteries in, and relaunching the UAV. Free-Space Power Beaming technology is here today, and it is safe. It powers the UAV while it is in motion and at altitude. The PowerLight platform also incorporates a virtual shield of safety that ensures the people and environment above, below and nearby remain safe. Industries that can greatly benefit from Free-Space Power Beaming technology with UAVs include military, telecom, maintenance (including pipelines and utilities), disaster response, law enforcement and border enforcement.